Circle the number next to the questions you answer “yes” to, then add up all the circled numbers and write the total on the line at the bottom. For each symptom that is present, write the appropriate number beside it. Total the scores for this section and record them on the line at the bottom of this section. Total the scores for this section and record them in the box at the bottom of this section. The total score will help you and your physician decide if your health problems are yeast connected. A comprehensive history and physical examination are also important. In addition, laboratory studies, x-rays, and other types of tests may also be appropriate. Scores for women will run higher, as 7 items in this questionnaire apply exclusively to women, while only 2 apply exclusively to men. If your total score for all three sections above was below 60 for a woman or below 40 for a man, then you are less likely to have a problem with candida. However, if you scored higher than this then you may wish to consider lifestyle and dietary changes, as well as a detoxification and cleansing program, all of which may help you feel healthy and more energetic. The best thing I have found to take away candida is Olive Leaf Extract. Truehope's worked best. I have tried other brands but they never seemed to work! This is the protocal they told us to follow when we called in and talked to one of their people who help you figure out what to take for each person's symptoms. ∙ If really struggling (with die off) decrease temporarily or increase slower depending on severity. ∙ After 2.5 months; lower 1 capsule every 2 days until off. ∙ After 2.5 months begin rotating Caprylic Acid, Garlic and Grapefruit seed extract and OLE every 2 weeks. The amount of "OLE" that you should take varies according to the reason you are taking it. ● For maintenance of good health and increased energy 1-2 capsules daily. ● For conditions of ill health 1-3 capsules three times a day. ● Children ½ adult dosage 1 capsule three times a day. Many people have reported good results from adding a capsule or two if they are exposed to germs or feel "run down" or "over tired.” Laboratory testing shows that OLE works best when taken shortly after exposure to a pathogen. So, staggering a few capsules throughout the day may work best (M.G. Soret, Anti microbial Agents and Chemotherapy: 160-166, 1969). Drink Plenty of Good Pure Water! When you are combating a particular problem with more than 1-2 capsules a day, be sure to drink enough good, pure water (Reverse Osmosis or Distilled). We recommend drinking 12-16oz of water for each capsule you take. Water helps the lymphatic system and flushes the kidneys. Drinking large quantities of water should prevent a detoxification overload (Herxheimer Response). In a nut shell OLE combats the yeast in the whole body. Threelac is used as a defense mechanism to stop yeast in the digestive tract preventing it to become systemic. Truehope now recommends using their GreenBac instead of ThreeLac. I haven't had any experience with that. ThreeLac is the most effective candida defense product in the marketplace. This proprietary formula is teeming with live bacteria that start to work immediately to help rid the body of resilient candida organisms. You can expect results starting with day one! Take ThreeLac right before you eat a meal. Let each packet dissolve in your mouth and follow immediately with 4-6 ounces of water, then eat. Food acts as a buffer to assist ThreeLac in reaching the small intestine, where it helps your body rid itself of the candida parasites. For more severe candida infestations, you may want to take up to 5 packets to start (for the first 30 days). ThreeLac may be taken all at once prior to a meal or spread out among two to three meals. After 30 days you may then reduce to a maintenance amount of one to two packets per day to maintain body pH. Once again we recommend drinking 8-12 glasses of water. Water helps the lymphatic system and flushes the kidneys. Drinking large quantities of water should prevent a detoxification overload (Herxheimer Response). You can try this simple test to see if you have a yeast imbalance that ThreeLac may help with: First thing in the morning, before you put ANYTHING in your mouth, get a clear glass. Fill with water and work up a bit of saliva, then spit it into the glass of water. Check the water every 15 minutes or so for up to one hour. 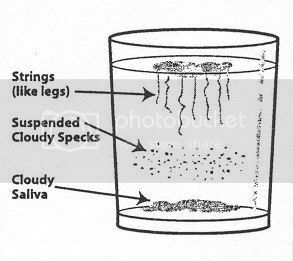 If you have a problem that ThreeLac can help with, you will see strings (like legs) traveling down into the water from the saliva floating on the top, or “cloudy” saliva will sink to the bottom of the glass, or cloudy specks will seem to be suspended in the water. If there are no strings and the saliva is still floating after at least one hour, you probably have candida under control. ThreeLac would then be used to maintain good bowel flora and proper pH. Cold/Flu and Sore Throat? No Problem!